← Let’s start off the school year right! There are now 14 Florida classrooms and about 1,831 students who are going to have extra help when it comes to science education because of our team effort. Our 4th annual fundraising campaign through Donors Choose raised a total of $2,943. You gave $2,243 and then we here at Florida Citizens for Science pitched in our promised $700. That blows away our previous fundraising record of $1,775 in 2009. Wow! Palmetto Grades 6-8: a document camera, graphic novels about hurricanes, and marbling art supplies to visually learn about the science of hurricanes and create a work of art representing the hurricane storm formation. Plant City Grades 9-12: students will learn how to reconstruct a crime scene and develop suspects after evidence is recovered. Students will learn to determine the caliber of bullets, determine the trajectory/path the bullet traveled, identify striations left on recovered bullets, and will later dust for latent finger prints that may have been left on the cartridge. Ft Lauderdale Grades 6-8: modeling clay will be used to create 3-D models of Earth’s features to planets and other celestial objects in outer space. We’ll use the plaster to investigate how fossils are preserved on Earth for hundreds of thousands of years. Having these supplies means less time with our heads in the book and more time creating and exploring. 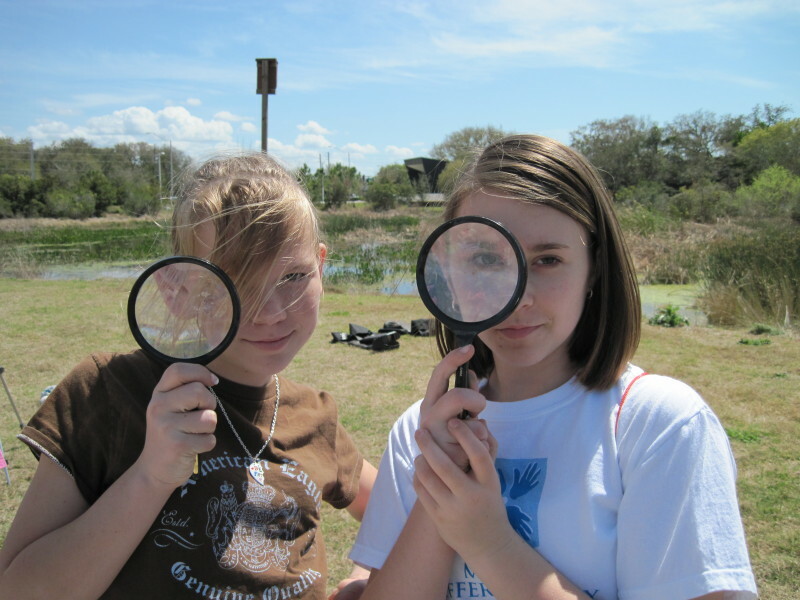 Tampa Grades 3-5: students will learn how to measure and read exact amounts of liquid such as in an environmental investigations testing water samples. They will use the tools to understand water displacement when adding a solid material. Graduated cylinders are critical for measuring liquid volumes. Miami Grades 6-8: students will be able to grow bacteria, look at cells and organisms, and see and work with models of the solar system in a hands on way. The materials will provide opportunities for my students to explore science concepts, test hypotheses, and learn through observation. Orlando Grades 3-5: students will be able to complete labs and experiments so they can connect their learning to what they are doing scientifically. They will have safety glasses, beakers, different types of scales, magnifying glasses and a microscope to complete the activities accurately and safely. They will also have different types of magnets so they can manipulate the magnets to show how they can attract and repel. Miami Grades 3-5: having complete STEM kits and books, students will have all the materials they need, to do projects and have extra materials for other projects. The STEM kits will be used to engineer and create projects. The students will need the writing and science journals to write about, design, create, and redesign their STEM projects. Naples Grades PreK-2: The “larvae” (caterpillars) are one way that our students not only get hooked on science, but also understand one of those mystifying processes of science. How does a caterpillar turn into a butterfly? It sounds like make believe to them until they get to see it. Brooksville Grades 6-8: Mini Stream Tables will engage students and allow them to have hands-on interactions with weathering, erosion and deposition so they can complete their challenge successfully. Students who are engaged and can actually interact with the material will want to learn! Seffner Grades 3-5: Most classrooms are not equipped with the materials needed to provide for safe experimentation, and just reading about electricity doesn’t give students the best learning experience. Being able to actually create open and closed circuits as well as figuring out how switches work through hands-on investigations will ensure that students will have a better understanding of the content that they are expected to learn. It will allow for greater application later. Palm Bay Grades 3-5: students will be able to learn how to use various weather instruments and make predictions about the weather. Learning to use tools has become lost to this generation of people who can simply turn on the television or a computer to find the answer to something. Students will dig deeper by taking learning outdoors to compliment the learning in the classroom. Students will explore, record and chart the weather in their garden using proper weather instruments. Leesburg Grades PreK-2: students will be able to enjoy pouring, washing, experimenting, and splashing (just a little!) in the safe environment of their very own classroom. It will be an important tool for science experiments and be a fun setting for imaginative students to pretend to wash cars or animals or create an ocean ecosystem. All of these experiences will allow students, who come from varied backgrounds that include different primary languages, to communicate with their classmates while they learn and play! Navarre Grades PreK-2: This raised garden will offer students from all walks of life the ability to build, plant, water, nurture and harvest herbs, vegetables, and fruits. Gardening allows surprises to arise when insects land in the vicinity or when the weather surprises everyone and disrupts the plan for the day. These surprises show that nature is in control and they give students immediate and personal reasons for wanting to know the answers to pressing questions. Tallahassee Grades PreK-2: On August 21st, 2017, a very rare event will occur. A total solar eclipse will occur for the United States to view. In Tallahassee, FL, we will receive 90% totality of the eclipse. The peak time is estimated to be about 2:40 PM. Our students may not have another chance to experience this natural occurrence for another 30 years. We will be partnering with another grade level to share this experience with. The students will be able to interact with the older students/science buddies and talk about the amazing phenomena happening before their eyes. With solar viewing glasses, students can view the eclipse safely, gain a science buddy to talk to and of course remember their ultimate hands on experience!